Viennese-born, and trained in Italy and Germany, Eugene von Guérard arrived at the Victorian goldfields in 1852. After two years of limited success, he moved to Melbourne to resume his career as a painter and settled there for the next 28 years, becoming a teacher at the National Gallery of Victoria Art School. 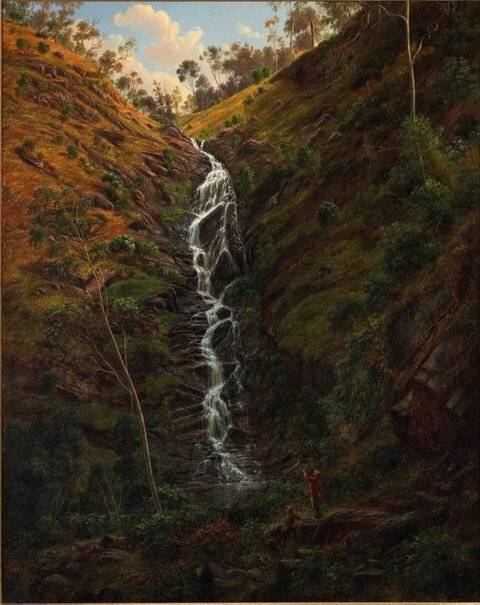 In January 1862, von Guérard made an exploratory expedition along the upper reaches of the Goulburn River in Victoria. Among various sketches, he made a large drawing of Strath Creek Falls (now Murchison Falls), later working it up in his studio. 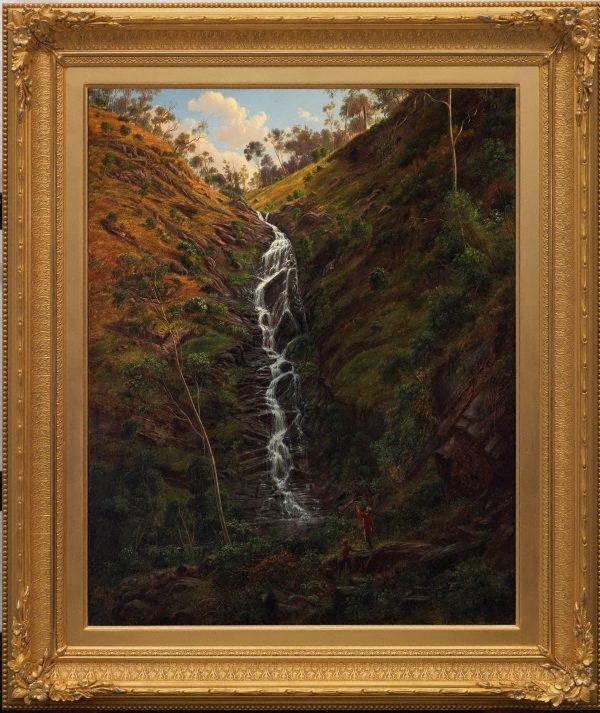 'Waterfall, Strath Creek' is imbued with a sense of awe and wonder, reflecting the German Romantic belief in painting as an expression of personal insight into the divine. Signed and dated l.l. corner, red oil "Eug.v.Guerard/ .../ 1862". Helen Campbell, Look , 'Waterfall: an inspiration to travellers and artists', pg. 19, Sydney, Jun 2006, 19 (colour illus.). Mary Eagle, The Age , ‘The man who preceded the Heidelberg School’, pg. 8, Melbourne, 24 Dec 1980, 8. Mary Eagle, Imants Tillers - Poem of ecstasy , 'Imants Tillers', pg. 3-6, Victoria, 1990, 6, 17 (colour illus.). cat.no. 5,; 'Untitled (Deaf)', 1989, references von Guérard's painting. Deborah Hart, Fred Williams: infinite horizons , 'Infinite horizons', pg. 156-183, Canberra, 2011, 168, 169, 209, 210 (colour illus.). John McDonald, The Sydney Morning Herald , 'Earthly pleasures', pg. 14-15, Sydney, 23 Jul 2011-24 Jul 2011, 14 (colour illus. ), 15. NOTE: This article was published in the 'Sectrum' section of the newspaper. Linda van Nunen, Studio collections , 'William Delafield Cook', pg. 148-151, Double Bay, Dec 1987-Jan 1988, 150 ( illus. ), 151. Barry Pearce, Art Gallery of New South Wales handbook , 'Australian', pg. 13-35, Sydney, 1988, 15, 16 (illus.). Anne Ryan, Australian art: in the Art Gallery of New South Wales , 'Colonial eyes', pg. 17-36, Sydney, 2000, 18, 29 (colour illus. ), 300. Lynne Seear, Darkness & light: the art of William Robinson , 'Introduction: the problem of interpretation', pg. 18-23, South Brisbane, 2001, 20 (colour illus.). David Thomas, Society of Artists Spring Exhibition , 'Works from the Wesfarmers collection of Australian art part 1: lots 1-23’, pg. 30-3, Sydney, 1912, 30. A work influenced by ‘Waterfall, Strath Creek’ offered at the Deutscher and Hackett sale 'Works from the Wesfarmers collection of Australian art’, Melbourne, 29 August 2012, 'lot no. 9, Fred Williams ‘Turritable Falls 1’ 1979. The Australian art companion - A selection of influential artists , Balgowlah Heights, (1990), 40, 41 (illus.). Australian landscape series , Sydney, 1987, (colour illus.). A century of Australian landscape: mood and moment , Sydney, 1983, 14, 20, 21 (colour illus.). Eugen von Guérard , Canberra, 1980, 54, 55 (colour illus. ), 69, 106 (illus.). Art Gallery of New South Wales picturebook , Sydney, 1972, 70 (colour illus.). The golden age of Australian painting - Impressionism and the Heidelberg school , Melbourne, 1969, 2, 3 (colour illus. ), 4. Masterpieces of Australian painting , Melbourne, 1969, 47 (colour illus.). Art Gallery of New South Wales Quarterly, vol 9, no 4 , Sydney, Jul 1968, 410, 416 (illus.). 1967 Acquisitions , Sydney, 1967, 24-25. Menzies, Melbourne: Australian & International Fine Art 24 March 2011 , Sydney, 2011, 62. Work being sold was 'Lysterfield Hillside II' by Fred Williams. Eugene von Guérard: nature revealed , 'The new landscape: Rome and Naples', pg. 48-75, Melbourne, 2011, front cover (colour illus., detail), 61, 205, 208, 209 (colour illus. ), 210, 291. Deutscher-Menzies & Lawson-Menzies, Sydney: Major fine art auction - 25 March 2009 , Sydney, 2009, 76. Quote by Fred Williams stating he found this work inspiring. Eugene's falls , North Melbourne, 2007, cover (colour illus.). Fictional recreation of the artist's life. Australian art , Oxford, 2001, 211, 212. 26/08/2001 Christie's Contemporary Sydney , South Yarra, 2001, 83. lot no. 89; Julia Ciccarone's 'Struggle to define', oil on canvas, 134.0 x 181.0cm, based on Eugene von Guérard's painting 'Waterfall, Strath Creek'. William Delafield Cook , Sydney, 1998, 171 (colour illus. ), 172. Art and Australia (vol. 34, no. 3) , Sydney, 1997, 10, 11 (colour illus.). AGNSW Collections , Sydney, 1994, 10, 11 (colour illus.). Sweet damper and gossip: colonial sightings from the Goulburn and North-east , Benalla, 1994, 20 (colour illus. ), 22, 27.